Music has such power to communicate emotion. I love Christmas music and the joy that the familiar songs and hymns can bring. I get so excited when the radio turns to Christmas music! I only listen to one station during December because of it. ;) Speaking of music, I am excited and thoroughly enjoying that my girls' piano practice has turned to Christmas music and I get to hear them learning those songs each day this month! - An Activity: This one is similar to Day 1's activity. 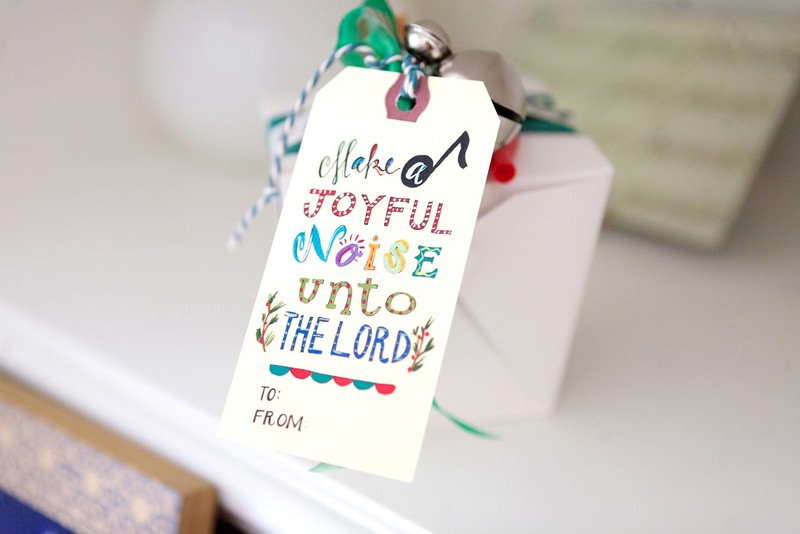 You could go caroling just to sing, or you could deliver holiday treats tied with the "Make a Joyful Noise unto the Lord" gift tag (included as a free printable). While we're on the subject of music and singing, I want to share this video with you. You may have seen it last year, but if you missed it, I think you'll want to see it! This is beautiful. I love the idea of these 12 Advent activities!! The video is very moving. I agree! I really loved it. I love the idea of caroling in your neighborhood and we used to do it when I was growing up. It is a lost art, for sure. I wonder if I can convince the kids to go with me now, LOL..
Really enjoyed that video! Thanks for sharing!